The bill still requires the formality of royal assent from Queen Elizabeth II to become law, which could come as early as Tuesday,. 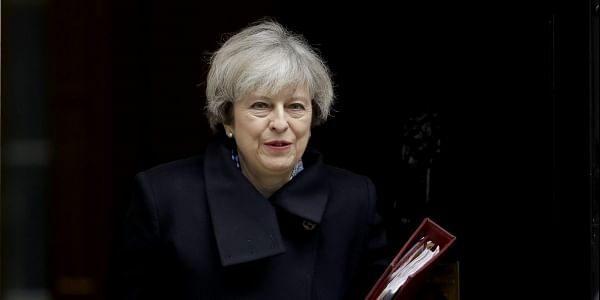 LONDON: British Prime Minister Theresa May will make a major statement to parliament on Tuesday, just hours after MPs enabled her to start the withdrawal process from the European Union. After weeks of wrangling, lawmakers on Monday finally granted May the right to trigger Article 50 of the EU's Lisbon Treaty, which would start the two-year divorce process with the bloc. The bill still requires the formality of royal assent from Queen Elizabeth II to become law, which could come as early as Tuesday, allowing May to begin Brexit any time after. The government is reportedly looking to do so after a March 25 summit in Rome to mark the EU's 60th birthday. The victory of May's government in parliament on Monday, however, was marred by Scottish First Minister Nicola Sturgeon outlining plans to hold a second independence referendum -- an indication of the obstacles that lie ahead. Warnings from Brussels that Britain will have to pay a hefty divorce bill and face tough conditions for leaving have added to the uncertainty, as have warning signs that Brexit is hitting the economy. Meanwhile in Northern Ireland, there are fears that leaving the EU could see a return to a hard customs border with Ireland, antagonising nationalists and threatening a hard-won peace in the region. May on Monday condemned the idea of another Scottish referendum, saying most Scots did not want it and warning it would create "uncertainty and division". The British government has the power to block Sturgeon's request, but this would likely only energise the Scottish nationalists' cause. In the first vote in 2014, Scots voted by 55 percent to reject separation. However, polls suggest any new referendum would be closer and Scotland's EU membership could be a key reason. During the EU referendum, 62 percent of the Scottish electorate voted to remain, compared to only 48 percent for the whole of Britain. A eurosceptic press in London has lashed out at Sturgeon's referendum plans, with the Daily Mail, Britain's second biggest-selling newspaper writing "Hands off our Brexit, Nicola!," while the Daily Telegraph described the SNP leader's move as "The new battle for Britain". As negotiations loom, the prime minister could also face growing dissent within her own ranks. "The unity of the Tory party is shakier than it seems," Tim Bale, professor of politics at Queen Mary University of London, told AFP. Decades-old splits in the Conservatives over Europe may resurface. While the eurosceptics are in charge now, most Conservatives wanted to stay in the EU. May's majority in the Commons is only slim, which has led to calls from senior Tories for a snap election to bolster her support as Britain heads into the Brexit negotiations.